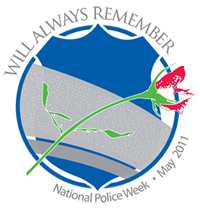 Saturday is the last day of National Police Week 2011. Most likely, you were unaware of it at all, but as a police family, it was on our minds. In Washington, D.C., 316 names were added to the Memorial Wall. Thursday night, my husband had the honor of singing at our local Police Officer Memorial hosted by our church. Law enforcement officers from surrounding areas showed up to represent their departments. Flashing red and blue lights filled the parking lot for the length of the ceremony, to shine as a beacon, while the color guard stood watch. The atmosphere inside was solemn as we listened to the melancholy sound of the bagpipes and songs of "A Few Good Men" sung by humble heroes. All was quiet as we lit candles to remember the fallen officers and honor the families they left behind. Then we moved outside to still flashing lights and silent men standing guard. The night air was pierced and the silence broken by the ritual blast of rifles, then a lone man called out in the dark "Officers 10-7." Thanks for sharing this! I had no idea there was a national police week until my husband became a police officer.